↑ "trigonometry". Online Etymology Dictionary. 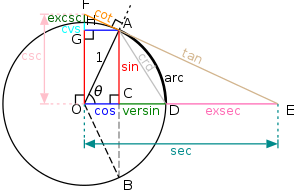 http://www.etymonline.com/index.php?search=trigonometry. Boyer, Carl B. (1991). A History of Mathematics (Second Edition সম্পাদনা). John Wiley & Sons, Inc.. ISBN 0471543977.